Far Eastern Electronic Toll Collection Co (FETC, 遠通電收) on Tuesday won the Private Sector Excellence Award at the World Information Technology And Services Alliance’s (WITSA) Global Information and Communications Technology (ICT) Excellence Awards after the company's electronic toll system was judged to have significantly improved freeway traffic and created huge economic value. The award recognized FETC's strong ICT capabilities among numerous information and communications companies from more than 85 countries around the globe in the running for the award. The award was created by the alliance in 2000 to honor prestigious ICT companies. “People use technology to solve problems. New technologies can help create new markets and new jobs for the younger generation. 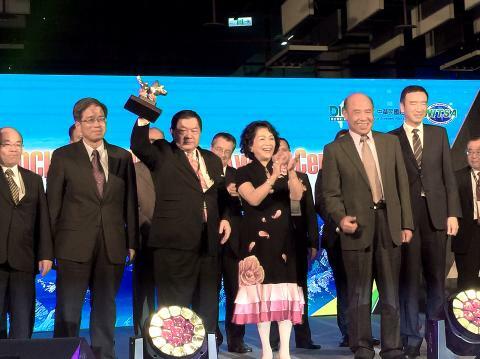 FETC is a proof to that,” Far Eastern Group (遠東集團) chairman Douglas Hsu (徐旭東) said in an acceptance speech in Taipei. “The company's electronic toll collection system helps prevent congestion on the nation's freeways. The system also creates new Internet of Things (IoT) business opportunities,” Hsu said. The system can also be exported to solve similar problems overseas, he said. FETC's efforts to promote the system overseas bore fruit as the company recently won a contract to help deploy an electronic toll system in Malaysia by providing consultancy services. The company has previously provided similar consultancy services to its clients in Vietnam and the Philippines. FETC managing director Chang Yung-chang (張永昌) said that the company has created more than US$2 billion in economic value since the launch of the system. Furthermore, eTag, developed by FETC to bill drivers for using the nation's freeways, will play a key role in developing the IoT market and a platform for big data analysis, Chang said. The system helps reduce pollution, improve traffic and improve services, Poisant said.